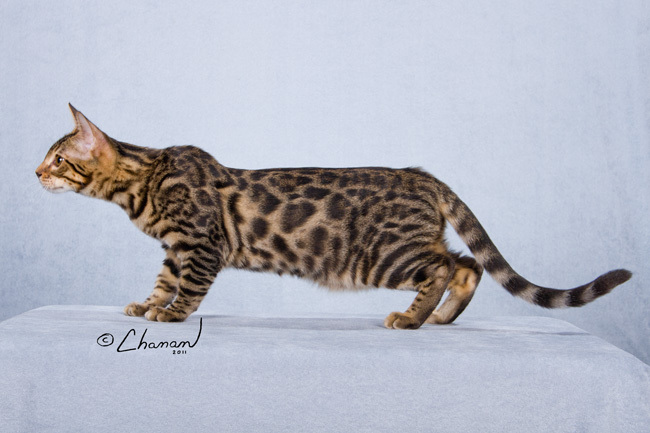 Adore Cats Bengals | Bengal Breeder of Pedigreed Bengal Cats for Pets or Show. 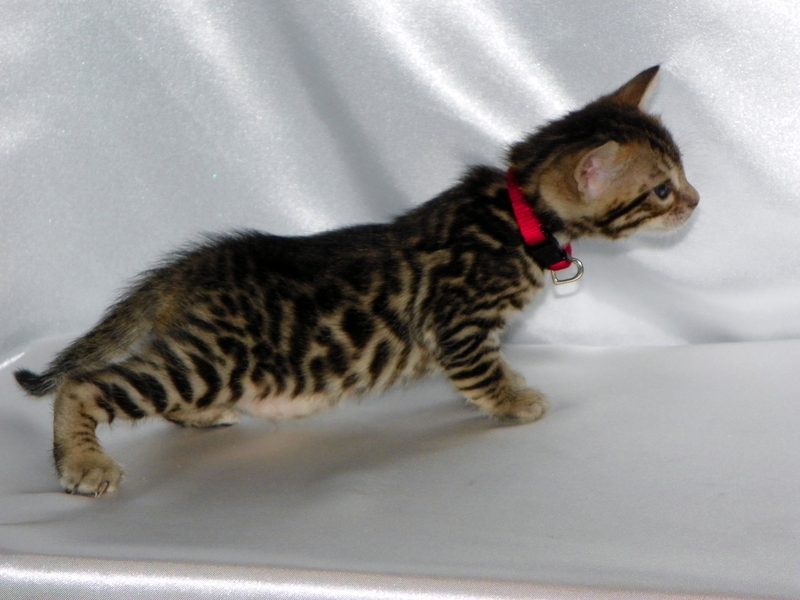 We offer Brown Spotted Bengals, Rosetted Bengals, Golden Bengals, Marble Bengals, Seal Mink Bengals, Seal Lynx Point (Snow) Bengals and Blue Bengals for sale. Our cats (or their parents) have tested negative for HCM, PKD, FeLV and FIV. We have Bengal kittens from Supreme Grand Champion Bloodlines!!! Serving USA and International pet lovers. Our Bengals are shown by appointment only. At Adore Cats Bengals we raise, show and sell some of the most beautiful pedigreed Bengal kittens and cats available. Take your time and browse our site. You will see some of the cats we now have and some that we have raised who have gone to be permanent members of wonderful families in many different locations. The kitten below is one example of our prior kittens. This is a photo of our prior kitten we called Adore Cats Bianca. She was about 4 weeks old in this photo. The photo below is of the same kitten Bianca when she was about 5 months old. This photo was taken at a cat show she was entered in. Adore Cats Bengals Bianca at about 5 months old at a cat show. Adore Cats Bengals Bianca at 4 years old. She went to live with her new family as a kitten. We appreciate her family sharing this photo with us and giving us permission to post it. 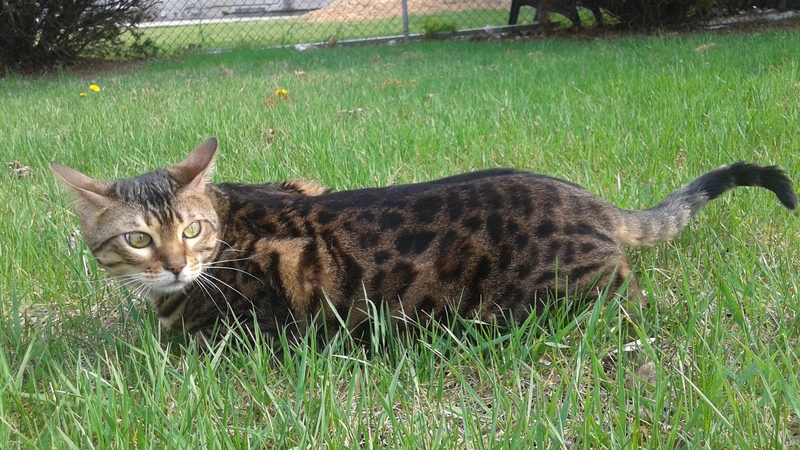 Hello, I was wondering how I can see some of your cats in person since I wod like to get a better idea of a Bengal’s personality. We have 2 boys, 6 & 8 yrs old, and I have to make sure that a Bengal would be a good fit for our family. I love the brown with rosettes but I find the silver/ white ones very interesting. We live about 35 min from the store so before I would make the trip, I would like to see if I can see some of your Bengals. Thank you for your interest in our Bengals. We would love to have you meet them. 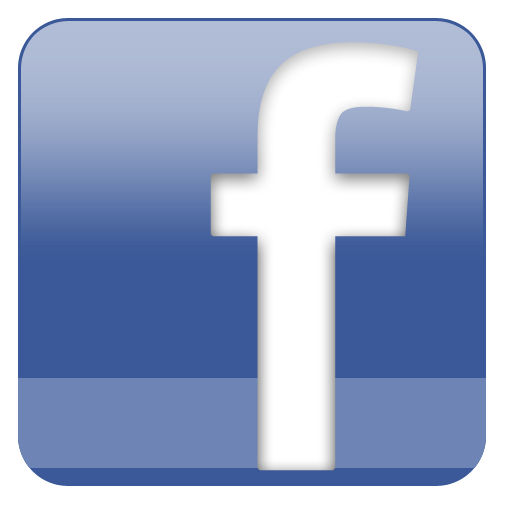 Fill out the Priority Request Form on our site and be sure to include your phone number. When I receive it, I will call you. Have a great day :-).